I think I know quite a few people that would be happy with dress up every day. For me, I enjoy it on occasion and with Halloween and a Halloween party to attend it was certainly one of those occasions. For my American neighbours this is a huge event, a highlight on the annual calendar of celebrations. Preparations and decorations starting weeks before the event. Everyone in costume certainly makes for a great party and easy conversation, meeting new people and barely recognising those you do know, everyone just chats to everyone. There were some amazing costumes, the whole cast of the Wizard of Oz, a few decked out in full on Day of the Dead make up (thinking a Cinco de Mayo party on the cards just as an excuse to dress up like that! ), a couple of pukekos, Lady Gaga, Mrs Brown, Wonder Woman, Gomez and Mortica Addams, Alice in Wonderland and lots more. An eclectic group to say the least, and quite a sight all walking down the road en masse down to the local bar for a few Halloween cocktails. On the menu Sangriaaaaah...a fruity bubbling and smoking concoction. A fun filled night and for me a renewed love of a little dressing up. Celebrating Halloween with my American friends meant that it had to be something candy like that I brought along. Not much is more American than popcorn so popcorn it was, though not just any old popcorn, Salted Maple Caramel with Spiced Salt to deliver both a sweet an a salty hit. This does come with a "sugar high is imminent warning"! Salted Maple Caramel Popcorn with Spiced Salt, adapted only slightly from Gourmet Traveller. Heat the oil in a large saucepan over a medium high heat. To check if the oil is hot enough drop in a couple of corn kernels and if they spin a little the oil is hot enough. Add the corn and cover with a tight fitting lid and cook for 4-5 minutes, shaking occasionally, until all the corn is popped. Remove from the heat and set aside. For the spiced salt dry roast the paprika and cinnamon for just a minute. Place in a small bowl, add the sugar and salt and mix well. To make the syrup add the water and sugar to a large saucepan over a medium high heat and stir until the sugar has dissolved. Bring to the boil and add the maple syrup. Cook until you have a dark caramel, about 5 minutes. Keep a close eye on it as it can turn quickly. Remove from the heat and add the salt and butter. Stir until combined and then pour over the popcorn. Quickly, as the caramel will start t set, stir well with a lightly oiled metal spoon. Spread on a baking tray line with lightly buttered baking paper and leave it to cool completely. Once cooled break in to rough bite sized cluster and sprinkle over the spiced salt. Crunchy, oh so sweet, a little salty and just a little hint of warmth and smokiness from the spices. I am surprised any of this actually made to the party as every time I passed the tray, my hand would reach out to pinch a few clusters of these caramel coated, spicy salt sprinkled treats. 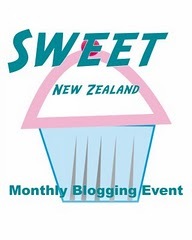 This is also my entry for this month’s Sweet New Zealand, created by Alessandra Zecchini and this month hosted by the lovely Sue, over at Couscous & Consciousness. I love dress ups. I have a few pieces of clothing I originally bought for Halloween costumes, but have ended up in my wardrobe instead of the dress up box. If wearing something that's slightly oddball makes your day brighter, I think we should actively pursue it. Caramel and salt are amazing together and I like the addition of paprika. Oh yes the dress up for grown ups....love it! Funny that the Americans love Halloween so much when it comes from our shores and the Driuds. So what did you dress as? Hi Alli, I went 70s, flower child...loved the 70s! Thanks for sharing at Sweet NZ. it is indeed addictive....surprised any made it to the actual party! Before I comment on this amazing popcorn, I have to say that husband and I do a lot of people watching and are bummed and amazed that people can be so uniform and boring. Wouldn't it be great if people didn't box themselves in and always try and fit in and be "safe"? But this popcorn....wow! Yeah, I could really eat a huge bowlful all by myself. So fun to dress up! I love Halloween. And I love this popcorn recipe - oh my...we're making popcorn this weekend! Yes dress up is fun....happy to have rekindled my fondness for it as when we hit all the Christmas festivities I am sure fancy dress will be making a frequent appearance!